Morepork / Owl Butlers will politely hold the door open for you everytime. 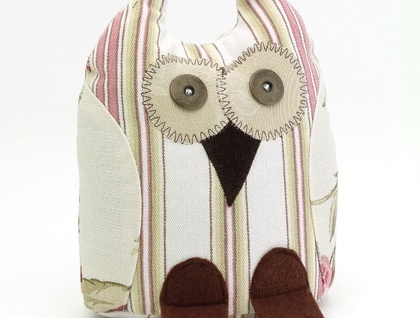 Delight your visitors and be welcomed into the room by these cute little owls. They also make obedient Bookends and enjoy spending their days perched on high shelves when given the opportunity. Hydrangea is made from Laura Ashley Upholstry grade fabric with a hydrangea floral print. The colours in the print; pink & bright pink, sandy brown, greens on a off white linen background. Her front is made from candy striped pink, green sandy brown and off white stripes that match the floral print exactly. She has Chocolate beak and feet, Whooo loves Hydrangea?